Perhaps you wander over to the meat counter and pick out two very thick, very juicy, very pricey New York Steaks. Surely this is enough meat to quell your suspected protein deficiency. But, no. You glance over at the sale sign. You see full racks of ribs. You grab one and put it in your very full basket of meat. Did I mention that the only reason you meant to come into the store was to get a can of coconut milk? This is why you opted for the basket. One item. No biggie. Now you look down at a heavy basket brimming with steak and ribs (and ground beef, and chicken — I told you, it was a meat-spree). The check out clerk looks at you like you should be ashamed. He’s most likely vegan. The kind of dude that has carrots tattooed on his forearms. You like him. He asks if you’re having a party. You simply say “A party of two”. He gives you a very distinct look, communicating with garish certainty, “you’re going to die”. The only response to this in that moment is a very toothy grin. Here’s the lesson I learned, folks: Once you put an entire medium rare New York steak into your body, energy starts to shift. This shift can be summed up as your body telling you, “No, Gina — we don’t need to make a rack of ribs tomorrow. Let’s do smoothies.” And, just like that, with the gold medal completion of the best steak my husband has ever cooked me, the meat goggles are off and the veggie goggles are on. I spent the next day pumping my body full of kale and crap. Oh, and I had to go back to Whole Foods because I forgot to get that original can of coconut milk. Meat goggles come with serious blind spots for anything other than meat, meat and more meat. The second lesson I learned is that after a day of kale-ing like a googly-eyed sheep (do sheep eat kale? I assume so), my body gives me a meaty, rib-ready thumbs up. However, at this point in time the ribs felt like a confrontation. I wanted the ribs, but I didn’t want the fuss of making them. Usually when I make ribs they are rubbed to perfection (See: Three Hour Sweet & Spicy Ribs) and then cooked in an oven for 3 hours. This did not pique my interest. It’s hot here. It’s still 80-90 degrees every day. To sit in a house where the oven is adding to my sweat-storm does not prove to be appealing. I also know how to make some pretty incredible beef short ribs (See: Red Wine Braised Short Ribs) that are cooked in a giant pot of wine for hours on end. No. I will not be putting my body near a stove for that length of time until it’s necessary to wear a sweater and/or I find myself saying things like “Hey, I’m really cold…let’s make a Hot Toddy”. The solution was simple: CROCK POT. I’ve been getting chummier and chummier with this appliance, and it’s yet to let me down. Who doesn’t love a machine that cooks dinner for you while you get through a work day? Also, there is no excess oven heat contributing to Sweat-Stache Summer Jams ’14 (this is the imaginary music festival I am holding in my living room. It’s where I listen to Fiona Apple by myself while sporting a glistening mustache of sweat — I’m not fancy). I settled on Asian flavors because, yum. 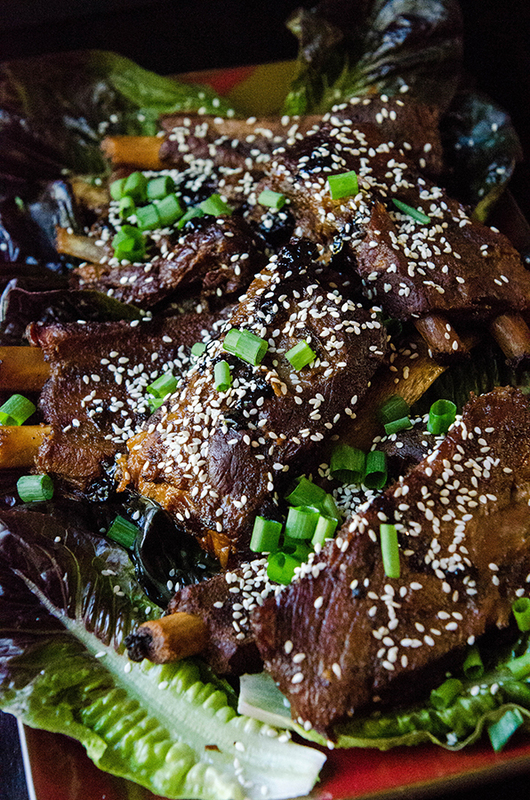 And, let’s be honest… ever since I made these Sticky BBQ Korean Chicken Wings, I’ve been looking for excuses to create similar flavors. I can’t get enough. Okay… I’m going to need you to leave me alone with this plate now. My meat goggles have returned. I’m not surprised. Set your broiler to high. Position your oven rack about 6 inches from the top of the oven. Line a baking sheet with aluminum foil and spray it with non stick spray (or simply use a little olive oil so that the ribs will not stick). Cut your rack of ribs into quarters and generously season them with salt, pepper and granulated garlic. Lay them down on the baking sheet and broil for 7 minutes a side, or until the ribs start to brown. Make sure to cook both sides. 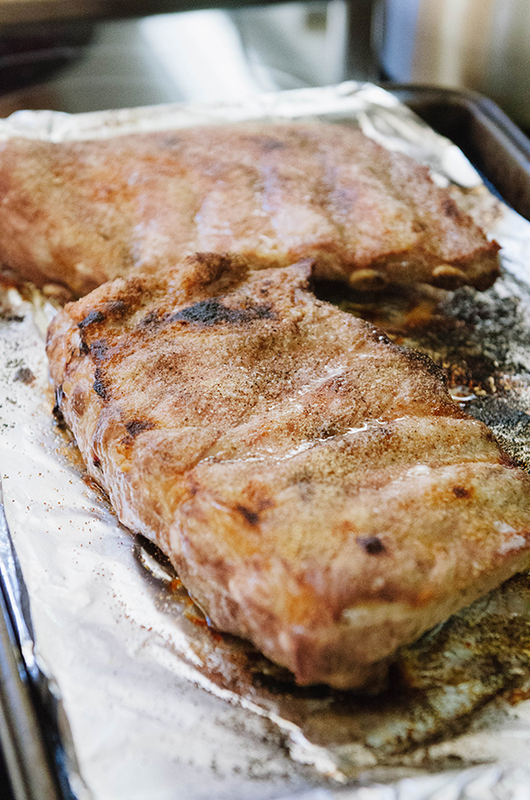 Once the ribs are browned, remove them from the oven and set them aside. Combine tamari, sesame oil, coconut sugar, fish sauce, garlic, minced ginger, red pepper flakes, lemon juice and scallions into a mixing bowl. Whisk together until the sugar dissolves. 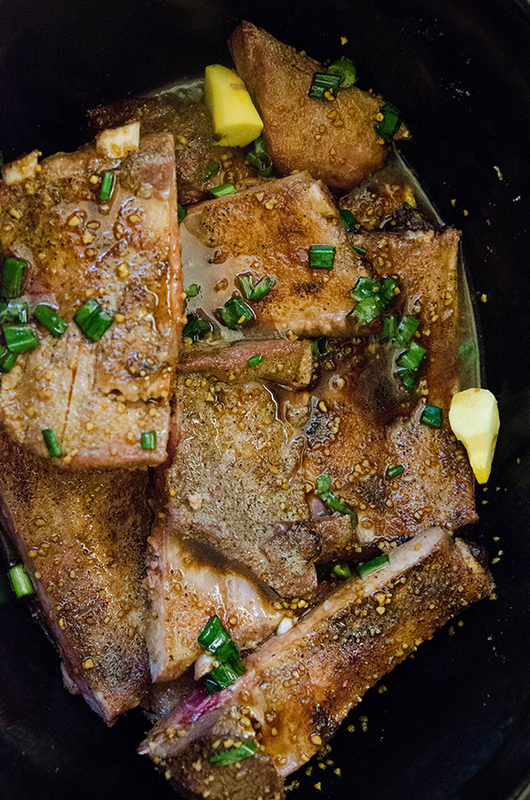 Cut your ribs so that you can fit them in one layer inside of your crock pot. Lay them on the bottom of the crock pot and pour the marinade over the ribs. Add the pieces of ginger root into the pot. 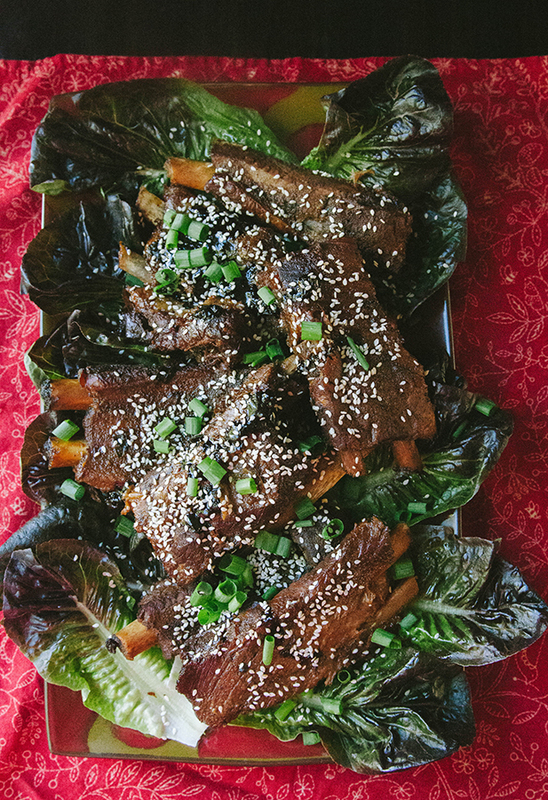 Set your crock pot on low and cook for six hours..
Once the ribs are done, remove them from the crock pot and garnish with more scallions and sesame seeds. Serve over rice, cauliflower rice, or veggies with a little bit of the cooked down marinade over the top for more flavor. If you don't finish them in one sitting, store them with all of the crock pot juices so that the ribs don't dry out. Enjoy! Oh these look so good Gina! But alas I do not have a slow cooker so I’ll start with your 3 hour ones which look equally incredible! I heart ribs!!! Holy effers these look good. I’m already pro-pork, but meat goggles have me in full-on lust mode. Nice going, G-Money. Oh my goodness, these look amazing! I had ribs as my birthday dinner last week. No carnivore shame. I also get the most magnificent sweat stache, sometimes I even get one when I cry! Why must facial wetness compound upon itself? Yummers. Totally drooling, sesame makes everything so much better no? These were very tasty and super easy to whip up! I cut the fish sauce in half but still found it too much for our taste. Next time I will just do a drop. A tip for others: I used Braggs liquid Aminos since that was all I had on hand. I do think it negatively altered the flavor outcome a bit so next time (there will definitely be a next time!) I will use my favorite, coconut aminos. 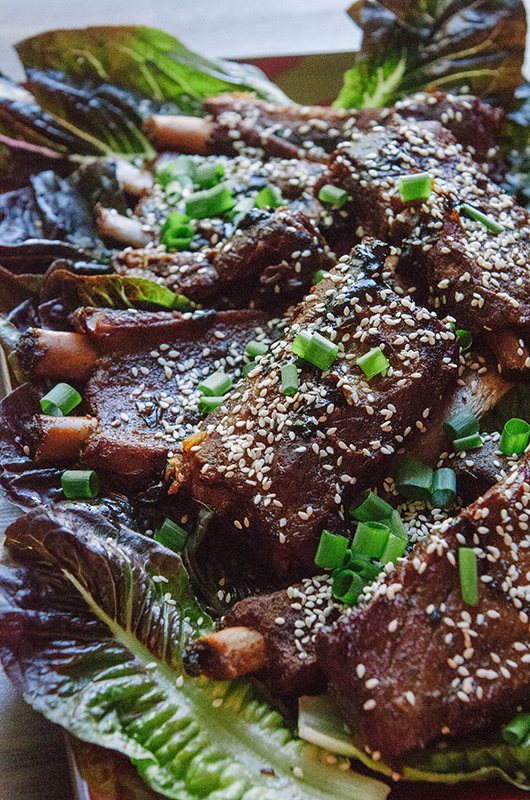 Why do Paleo recipes never give you the fixins for a whole meal? Most of the time only the how to for cooking meat is available. I just started eating Paleo and really would like, along with i.e. the rib recipe, also know what to fix with them.